The United Nations Association is a UK pressure group which tries to ensure the UK government fully supports the UN. It is not part of the UN. See below for our current projects and role vacancies. Pick the ones you prefer, then apply via our volunteering page. The Branch Secretary is available at any time to provide support as required. Relevant training can be provided to enable you to fulfil your selected roles. We will train you to deliver workshops about the UN and topics such as war (dealing with child soldiers), peace and reconciliation. Last year volunteers presented to 6th form students at various schools and colleges in Coventry. This year we are planning to hold a Conference for Schools in conjunction with Warwick University Law School. Work with your friends (or persuade others) to create short videos about how to make simple changes in your lifestyle to help achieve the UN Sustainable Development Goals. The videos could be funny, bizzare, controversial or straightforward but above all they should and inspirational. See this page to find out how. Peace depends upon people from different nations, cultures and religions trusting each other, and trust begins with conversation. So UNA Coventry will be organising a series of walks in which people can meet and talk to each other and share ideas in a relaxed and informal setting. We need people to help manage and publicise the walks which will include a place to stop and take refreshments. Above all we need to engage people from various cultures and countries, and this will include both students and citizens of Coventry. We are working with Coventry City Council, West Midlands police and others to create a Community Justice Forum. Volunteers will be trained to deliver restorative justice and so further the UN goals to deliver peace, justice and sustainability into people’s lives. UNA Coventry will be running a Counter-Terrorism Conference in March 2019. We ran a similar conference in 2018 and it was very successful. See http://unacov.uk/counter-terrorism-conference/ for details. We welcome students’ involvement in the planning of this conference. We are considering starting a project to explore the human rights situation of refugees and asylum seekers in Coventry. Please let us know if you are interested in driving this forward. We need to communicate about the important functions of the UN to the people of Coventry. Can you help us by writing press releases, talking to local radio and newspaper journalists and using social media to promote key information about the UN and the work of this UNA Branch? You will help us manage and support volunteers and ensure they have all the resources they need to fulfil their roles. 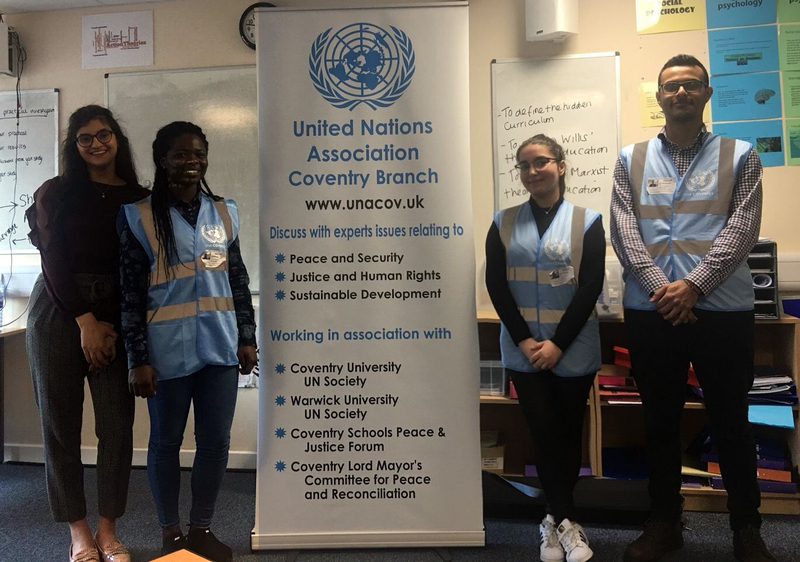 We work in association with the UN Societies at both Coventry and Warwick universities. We need coordinators who can ensure we work more closely together to achieve results. Help us raise cash to support UNA-UK. Download the fundraising pack for some ideas or create your own.